A tale of armed baboons, ancient riddles, and a genetically enhanced talking terrier with a human neo-cortex. At a top secret science project deep in the English countryside, boffins have found a way to enhance animal brainpower. 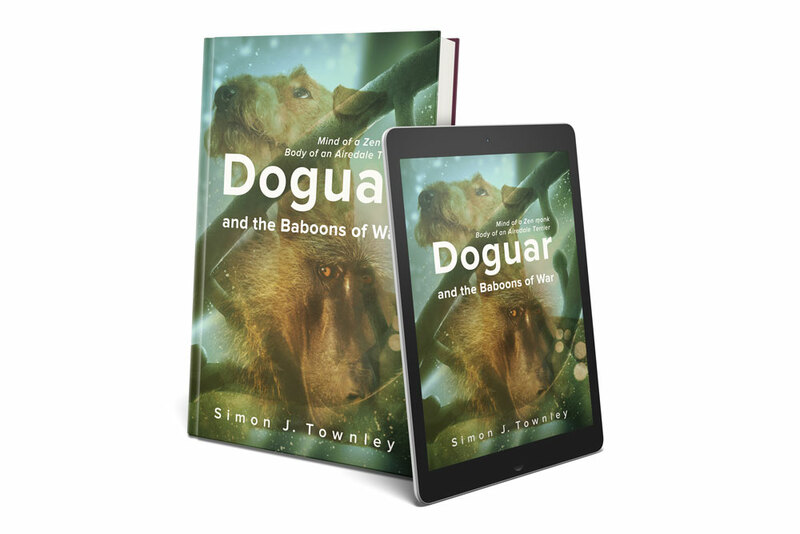 But the scatter-brained professor behind the research is unaware of a sinister plan – to use his upgraded baboons as weapons of war. Luckily, his pet project, two Airedale Terriers with near-human intelligence, have a nose for danger. But will Doguar be smart enough to escape the clutches of the evil genetics corporation? Can he save his beloved Ruby from the men who want to dissect her brain? Is there any way to defuse the time-bomb in his own DNA? Or decipher the 1,000-year-old Zen riddle that holds the key to the Professor’s secrets? A biopunk adventure for readers of all ages. Universal link to a whole heap of bookstores. The paperback will be available through Amazon or direct from Createspace by the Spring Autumn of 2016.